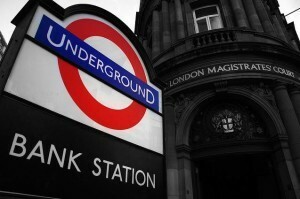 The Evening Standard has picked up a YouGov poll about Londoners' favourite and most hated tube stations. No prizes for guessing that Bank-Monument comes out as most loathed; it's the eighth busiest tube station with 47.8m journeys in 2011 and has been suffering refurbishment works that make its warren of tiny tunnels even more hideous. But at least TfL recognises the need for improvement and is planning to retunnel the Northern line and create a new entrance which, since we wrote about it in 2010, is now being consulted on. Other hated stations include Oxford Circus, Elephant and Castle and King's Cross – all busy ones, though we note that the inclusion of King's Cross doesn't always mean improvements equal passenger satisfaction (especially not when the improvements make you walk a longer way round. Grr). Favourite station is Canary Wharf – spacious and light, yep, we understand that one – Charing Cross, Baker Street and London Bridge. London Bridge? Have the respondents ever used it at rush hour? We find ourselves being held at the gateline more often than not. Oh, the horror. While trying (and failing) to find the original data from YouGov we dug up another tube-related survey (PDF) from February that piqued our interest enough to share. 51% of Londoners surveyed thought that lower fares should be the main priority for London Underground; 67% thought they would never or rarely use the tube during any potential extended running time, though 74% thought the tube should stay open later than it does.